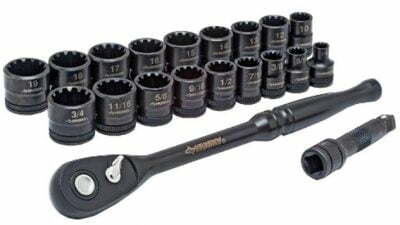 Husky’s universal socket wrench set fits 6-point, 12-point, square, E-Torx, spine and partially rounded hex fasteners. The 100-position, long handle ratchet has a 3.6-degree arch swing that’s perfect for working in tight spaces because you don’t need much range of motion to tighten or loosen the socket. It also comes with a flexible extension bar, so you can get to hard-to-reach nuts and bolts.